THE DOORS ALIVE is not just a concert, it’s an experience. THE DOORS ALIVEcelebrate the legendary music of THE DOORS taking great care and attentionto re-create the true essence and magic of THE DOORS. With the surreal ability to capture the iconic look, attitude and distinctbaritone voice of mystical figurehead Jim Morrison, the band showcases themusical chops of the original band members with ease and finesse. Taking theaudience on a nostalgic musical journey, THE DOORS ALIVE use the very sameinstruments that members of the original band played. Earning five-star reviews as well as the highest praise Doug Cameron (TheDoors Assistant Road Manager 1968/69) “The best Doors tribute band that I’veseen.. 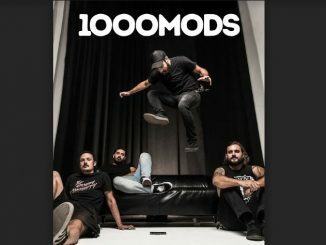 Sometimes they sound more like The Doors than The Doors”. THE DOORSALIVE re-creating all your favourite classic DOORS using the very sameinstruments that members of the original band played leaving crowds theworld over awestruck by show. “a very metaphysical experience” was how a fandescribed it. Special music lasts forever and is not just a product of its time. 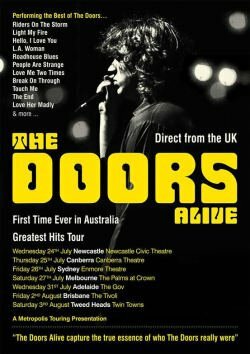 Promisingto be a celebration of remarkable proportions, don’t miss THE DOORS ALIVE asthey re-capture the greatness of THE DOORS and bring their amazing songbookto life in Australia for the first time ever!